Our brains have done a fair bit of milage recently with George travelling to LA for the Communicating the Museum conference and Charlie flying over to Belfast to talk at the Digital Tech, Young People & Heritage conference at Ulster Museum and also exhibiting at the British Museum’s 3D Imaging in Cultural Heritage conference. December 2015: Early brain prototype combined with the statues of women around London set. We later decided to separate the brain into an independent starter box because the variation of possible 3D prints and postcards in the box is so great. This gives us more freedom now when packaging up each unique collection. November 2016: An experiment developed with Moo Ltd using their plotter machine and a square brain. This included a space for a set of NFC cards. February 2017: Starter box comprised of many laser cut layers of card. Solid but used an unnecessary amount of material, was heavy and there was a great deal of wasted space. July 2017: Stacked foam insert, the brain sits above the starter introductory print and plug. We liked this foam design but for small quantities we’d need to laser cut and stack multiple layers which is both time consuming and costly. In this new design the brain sits above the insert, when you remove the brain the plug and print tucked away underneath are revealed. We adapted the foam design to allow for the slightly bulkier Rasperry Pi plug. Doing this means we could easily change the plug type and send a starter box to almost anywhere in the world without the need for an adapter… it’s the small things that count! The box is made out of three parts: the box itself (a), the insert (b) and the tray (c) glued to the underside of the insert. The real challenge was designing an insert that works with the many different plug adapters of the Raspberry Pi universal plug! The packaging is a great improvement on the older bulky and heavy box making it much better for sending in the post. Having travelled around with this new box however, we’re now thinking we can make it smaller still! Hopefully this has been a brief but insightful overview for any packaging nerds out there! We liked how this is different from the classical forms of, say, the US National Archives. We were on a roll that day, so then went to visit the Wellcome’s Museum of Modern Nature exhibition, where contributors chose an object important to them, and which reflected a sense of nature for them. All of us thought this exhibition would be especially well suited to being a Museum in a Box, since it was a set of curious objects, many of which had an audio track to listen to. It was lovely to hear each contributor’s voice in situ describing the object’s meaning in the first person. A tiny piece of note paper meticulously filled over time. Then, on the Thursday last week, we were hosted by Charo at the library of the Department of Greece and Rome at the British Museum, this time with a research mission. We’re interested in the idea of a Museum in a Box that contains a series of correspondence between two people. As you experience the box, letters could be delivered to you in approximately real time, as if you were the recipient(s). So, we went to the library to investigate some examples of correspondence. Charo rightly asked us for some direction about what she could present to us, and we discovered the character called Charles Newton, who was the first Keeper of the department when it formed in the 1860s. He was a fascinating figure with a huge network of contacts, including private collectors like Castellani (2,750+ things), and archaeologists like J. T. Wood (2,589 things excavated by), who was responsible for the first excavations at Ephesus. The acquisition history of the British Museum is a personal interest of mine, so it was a real thrill to see, touch, and read some of the letters sent to and by Newton in his quest to build out the incredible Greek and Roman collections at the BM. All in all, an excellent week of adventuring outside the office. Highly recommended! We spent the end of the day yesterday watching all of Sir Ken’s TED talks. I’m slightly embarrassed to be the 46 millionth human to see his first one from 2006, but there you go. He speaks about how fostering creativity in kids has been squashed by education systems that are oriented towards testing and standards and entry into university, and not respectful of diverse types of intelligence and different human capacities. Intelligence is diverse, dynamic, and distinct. “Education dislocates people from their natural talents. “Human communities depend upon a diversity of talents, not a singular conception of ability.” How can we reconstitute our sense of ability and intelligence? Boxes we’ve made to date have been about creating complete sets of objects around a theme like Ancient Egypt: Daily Lives, or Frogs of North America, and, while we definitely think there’s a lot of utility in being able to create a replete set to deliver (perhaps to younger kids), we’ve been exploring ideas around more serialised delivery of box contents, so object-based enquiry builds themes and knowledge over time, prompting students to do independent research as the collection builds. We’ve also heard over and again from teachers that they see great potential for a type of Museum in a Box that kids could construct themselves. 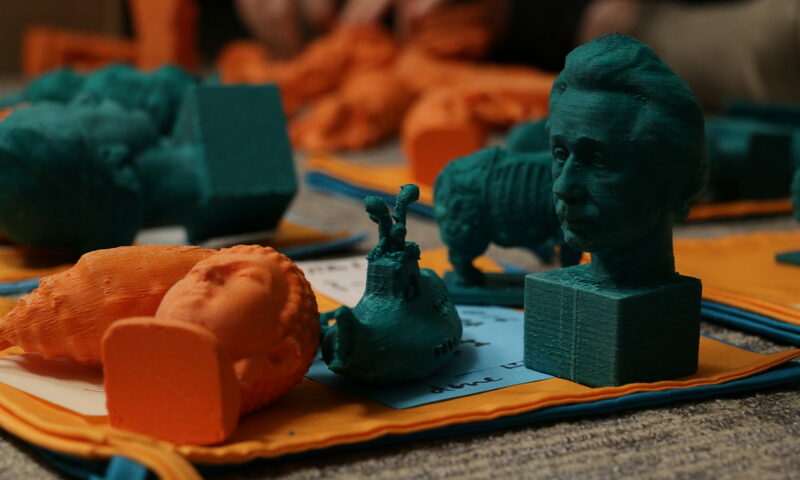 We’d deliver the core elements (Brain/Stickers/Software), and the kids would invent their own sets of objects and content, and make a museum they’re into. We love this idea — and I think it plays into Robinson’s thread of “learning that’s customised to local circumstances” — so we’d like to let you know we have started R&D on a product line called Make Your Own box as a result. We’ll need some time, but, we’ve heard clearly that this sort of exploratory, self-directed, cross-curricular exercise would be great for teachers and their students, so we plan to try to meet that demand. Stay tuned as we pilot this idea – we’ll let you know how we’re getting along! And if you’re a teacher who’s interested to help us during the pilot, please get in touch. Having never been to Liverpool before I jumped at the chance to make the two or so hour train ride to visit Adrian who is based at DoES Liverpool, a maker space which he co-founded in 2011. On arrival I was introduced to all of the friendly faces, claimed a desk and set my intro music to a piece by Frédéric Chopin (the space is rigged to play an audio file when you ‘tap-in’ in the morning). I was also introduced to the talking fridge, the gesture bin and the internet-connected coffee machine. Welcome to the wonderful world of DoES Liverpool! The space is divided between the co-working space and the workshop which has a wealth of kit including two laser cutters (Gerald & Sophia) and several 3D printers. I arrived with a list of things I wanted to get done and so wasted no time with cracking on. One experiment I had a chance to play with and develop was a cardboard Museum in a Box. I’d prepped a flimsy mock-up in London and was pretty chuffed with the outcome so decided to refine a neater version in the workshop at DoES. This was also a useful opportunity to try out a different internal configuration and a new way to access the tech inside the box. Adrian and I managed to squeeze in a trip to the Garstang Museum, a museum named after Professor John Garstang, who founded the ‘Institute of Archaeology’ and associated museum in 1904. Despite its modest size it’s packed with fascinating objects, most of which were excavated by Garstang in Egypt, the Sudan, and the Near East; the collection also contains almost twenty collections of glass-plate negatives relating to Garstang’s archaeological work in these areas. Several of the images have been enlarged and line the walls of the museum providing a fantastic insight into the world of archaeology in the early 20th century. Something that struck me was the amazing collection of Shabti that are on display in one of the exhibition spaces. Shabti were funerary figures who accompanied the deceased to the after-life, left alongside them inside their tombs. The poorest people may not have had any but even those tombs of modest size would have contained at least one or two Shabti. Those on display in the museum clearly show the range of Shabti and their corresponding value because of the materials used (wood, stone and faience) and their size (from ~10mm up to ~30cm), it was great to see such a diverse representation of people come together within one display case. If you’re in Liverpool and have a spare hour I can absolutely recommend heading to the Garstang but be sure to plan carefully as the museum only opens on between 10am-4pm every Wednesday. Back at DoES I was really enjoying being able to work on an idea in one room and nip next door to quickly mock-up a prototype in the workshop so much so that I was still laser-cutting minutes before having to leave to catch a train back to London. I was able to work on and develop some fun ideas including an architecture box which I’ll share some more info on in due course. Thank you Liverpool! First came lots of planning, then sketching and then I got to work CAD-ing up the design. Creating the design digitally first was beneficial as it provided the ability to position the components in a virtual space, adding the wires also helped to visualise how crowded the Brain would be. The most notable change to the design was how the Brain is held together. We currently glue panels with interlocking finger joints, but for this design they slot into channels on the top and bottom and are pulled together with brass standoffs in each corner. We often get asked how the Brains work but it’s not always easy to demonstrate, we therefore laser-cut the panels in plywood and clear acrylic making it clear to see what’s going on within the skull. After some light sanding the Brain assembled for the first time and the components easily mounted to the dotted grid. Most importantly the feet can be unscrewed and the base panel lifted providing easy access to add and remove parts. This Brain has enabled us to improve upon components that were appropriate in the past but no longer live up to our requirements. One example is the power socket which was previously glued to a laser cut shim and had a tendency to come loose, we managed to source a panel mount version which now works a treat (see pictures below). I’m very happy with how well the design turned out, I’ve lost count how many times I’ve disassembled and reassembled it. We’ve primarily been using it as a prototyping Brain to quickly test out components and content but it’s also made us big fans of acrylic and we now have plans for a colourful set of CMYK boxes! We’ve made about 20 prototype boxes now and have learned a great deal from each one. We wanted to highlight one particular box we made a couple of months ago where we experimented with a smaller form and what making it has taught us. The design of the box or ‘skull’ (the plywood/acrylic case that contains the tech) as we refer to it is dictated by two things: the form factor of the Raspberry Pi in question and all the features we feel necessary for the product to have. Early on we were creating boxes with the Pi 2 which required a dongle to connect the box to the internet but several months ago we switched to the Pi 3 which features built-in WiFi saving space within the skull. Raspberry Pi also make the ‘Zero’ which is about half the size of the Pi 3, we liked the idea of a small box which would be more transportable and also not require mains power connection so we designed a smaller square brain inspired by the recorder box we made back in October. We tested the box at Nottingham’s Explorers Fair (we’ll share a post on that soon) where we had it set up alongside the standard rectangular box. Seeing the two side-by-side it was clear the rectangle with its larger surface area provided more of a platform for the children to place multiple objects on top of however the square allowed them to pick the box up and put it to their ear or sit down on the the floor with it. We do love the smaller form factor but when you put the two designs side-by-side the larger rectangular box has a greater presence, not to mention more room for fiddly cables and components. It was a great thing to prototype and has since influenced alterations for our bigger boxes. This won’t be the last you see of square boxes however, I’ve had some fun recently prototyping a bigger ‘Design-for-Disassembly box, but all that is for another day.